Very little is known about Robert Davis. His name as a clockmaker was completely unrecorded until I happened upon a clock by him some years ago (plates 1 and 2), a simple thirty-hour single-hander signed 'Robert Davis Burnley Fecit 1723'. This was some time about 1974 or 1975, when rustic country clocks were little regarded. Robert Davis was, as still is, known only from the date on that particular clock. He first appeared in print in my book Watchmakers & Clockmakers of the World, Volume Two, first published in 1976, though he had failed to make it into Lancashire Clocks & Clockmakers, which was published in 1975. The clock itself is illustrated in my book Complete British Clocks, published in 1978. I sold that clock at that time to a private purchaser, who just happened to like it. What seemed to me very important, was that he was the earliest known clockmaker to have worked in that town - the very first Burnley clockmaker and previously unheard of. I thought in my innocence that a local museum would be bound to be interested in such a thing - if I were a museum curator, I certainly would have been. I can't remember how much it was at that time, but probably less than the cost today of a decent dinner for two. I offered it to the nearest museum in the locality and got the reply, not the usual one that they couldn't afford it, but that it was 'not suitable'. I still to this day can not understand this attitude, which rankled all the more with me as this was at a time when museums were making newspaper headlines by buying things they believed they should save for the nation. One bought a sculpture made out of sliced bread. Another bought a sculpture which consisted of house bricks, laid together artistically. We are all now older and wiser, and most museums still don't have clocks by their earliest local clockmakers in their collections, though some may have fine collections of house bricks. I don't know how many still have sliced bread sculptures, or how they have stood up to the ravages of time, but these must be a bit stale by now and pretty well worthless, whereas today you could probably add two 0's onto the then price of the clock by Robert Davis. Some years later I came across another clock by this same maker, this time an eight-day - plates 3 and 4 - signed simply 'Robert Davis' without any town. I have a vague recollection that that one was bought by a museum. This far our total knowledge of this maker was based purely on what we could see of his work in these two clocks. Then I heard of another clock by him, details unknown, but which was said to bear the date of making on the dial -1695- though I never saw this clock. Searching in local records failed to turn up anything on this man. You mighty think the name Davis was common everywhere, but in fact Davis is certainly a very uncommon name in Burnley at this period. Of course, Robert Davis would only feature in local parish records if he married or had children baptised. If these events took place elsewhere, or if he was a bachelor, then he would go un-noticed. 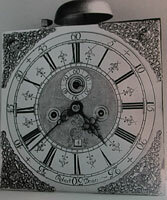 But now another clock by him has surfaced recently, illustrated here, signed at Burnley, 'Ro: Davis, Burnley'. This is what we call a real 'sleeper'. It must have lain forgotten for many years, perhaps in some loft or barn. We often see clocks which have lain untouched and uncleaned for a century. By comparison I can only guess that this present clock must have been untouched for two hundred years. In fact its condition is such that it may never have been cleaned since the day it was made. The illustrations show the accumulation of grime, cobwebs, etc., and this is exactly how we like to find them, for two reasons: one the clock can be seen not to have been got at by bodgers, and two the clock is likely to be relatively unworn, since it probably has not run for over a century. 1. Dial of a single-handed thirty-hour clock with plated movement signed and, most unusually, dated 'Robert Davis Burnley fecit 1723'. Click for closer view. 2. Twelve-inch dial of an eight-day clock signed by Robert Davis but without any town specified. Was it still made in Burnley, or somewhere else nearby? Date probably 1720s. Click for closer view. 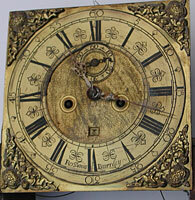 This makes a total of four clocks so far known by this maker, though there must be others yet to be discovered. If he was working by 1695, and if his later work dates from as late as perhaps 1723-30, that would give him a working life of at least 35 years. A correspondent informed me not long ago of a previously unrecorded clockmaker who worked at Burnley called Thomas Adamson, who supposedly died there in 1699. How he got this information I do not know. This is an exceptionally early maker for Burnley, though I have not been able to confirm that death date from local records. Adamson is not a common name in the area. I did however come across the baptism in 1657 of Anne, daughter of Thomas Adamson of Burnley, and this seems likely to be the same man. Trades are very seldom stated in these early records. A clockmaker working this early would be very unusual anywhere in Lancashire, and we can only hope that one of his clocks will turn up one day. If Robert Davis was working there by 1695, as the dated clock suggests, then it seems likely he would have been successor in the trade to Thomas Adamson, who was presumably elderly when he died in 1699. Assuming Thomas was relatively young when his daughter was born, he must have been at least sixty two years old when he died, maybe older. Robert Davis would presumably have been at least twenty when he began making clocks, which makes his birth 1675 or earlier, and this would put him at about the right age to have been an apprentice of Thomas Adamson, or, if not, then at least his successor in business. This very tentative evidence is mostly guesswork, but it is all we have, and it does make sense in terms of the progress of the clock trade there. If Adamson was Burnley's first clockmaker, then we know him today only from his name in records, as no clock is today known to exist by him. So Robert Davis is at least the first clockmaker to work in Burnley by any work is known to survive. So what can we deduce from the three examples of Robert Davis's work available to us? It is difficult to compare the stylistic features of the single-hander with those of the two eight-day examples. What we do know is that this was made in 1723. The eight-day ones are difficult to date exactly but were probably made in the 1720s. 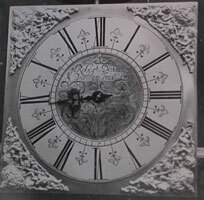 The treatment of the dial centres is very different between the two types, as the thirty-hour has engraved tulips, typical of lantern clocks and early thirty-hour longcases (which were the cheaper type of course), whereas the maker has used the more sophisticated and 'up-market' matted centre for his eight-day clocks, which were the costlier type. I think he did his own engraving, as there are several signs pointing towards this. Firstly, his matting is not very good. Look at matting by the best London makers of the day, and poor Robert's is sadly feeble. The grain is coarse and 'runs' can be seen made by his matting roller. The townless clock (plate 3) shows this grain and the runs, but his Burnley eight-day (plate 5) shows them even more plainly. I suspect that an expert who specialised in engraving (and matting too) could have done a lot better. Robert Davis did his own, which was cheaper than paying a specialist and could be done more conveniently as and when needed, without the delay inherent in sending away. His work may be less skilled than that of an expert, but the interest for us is that we can see his own work, warts and all. Robert Davis probably did as much work as possible 'in house' out of a desire to keep the cost down. The first clockmaker in Burnley would have struggled to find buyers. If Thomas Adamson was in fact the first, a generation earlier, I wonder he could have survived at it, which may be why not a single example of a clock by Adamson is known to us today. Selling clocks in Burnley today is not the easiest task. In 1720 it must have been a struggle. In the 1670s nearly impossible. The engraving of Robert Davis's chapter rings is interesting and informative. The thirty-hour ring is neatly done, using a slightly unusual half-hour marker starting out as the lower half of a trident on a stalk and rising up to a sort of three-leaf flower. He has made a slight slip of the engraving tool on the outer edge of the thin stroke of V. In his townless eight-day he uses the same half-hour marker, but with the upper strokes extended like a pair of crossed swords. Another engraving tool slip can be seen on the 'crossed swords' of the 12.30 marker. On the chapter ring of his Burnley eight-day he uses a different half-hour marker of meeting arrowheads and C-scrolls but with the same top-piece, except where the name is engraved between V and VII, where he hasn't room for the top-piece. A slip of the engraving tool can be seen on the half-hour marker between IV and V.
3. Twelve-inch dial of the recently-discovered eight-day clock signed by Robert Davis of Burnley, with many stylistic features in common with the other eight-day clock. Date probably 1720s. Click for closer view. 4. The oak case of the eight-day Burnley clock is of a style known especially around the Haworth area, Haworth being the next closest parish to Burnley across the border in Yorkshire. Burr walnut crossbanding. Click for closer view. The half-quarter markers on his two eight-day clocks are interesting - thirty-hour clocks of course don't have them. On his townless clock he used an indicator of four meeting arrowheads, positioned, as we would expect, to indicate those points which were half way through each quarter of an hour - i.e. at 7 _, 22 _, 37 _, and 52 _ minute positions round the dial. On his Burnley eight-day he used a different marker for his half quarters, rather like a diamond shape with shading. He managed to put these in the right place eventually, but we can see that he twice made a mistake in putting them where they should not be - the 'extra' one at 12 _ minutes past and another 'extra' one at 42 _ minutes to. The reason for this is that an engraver worked with his object nailed down to a turntable, so that he could constantly turn the metal round to enable him to work with strokes directed away from his body. This means that much of the time he worked with the object upside down, and it was very easy to forget just exactly where you were on the circle - as Robert did here twice! No question of throwing the chapter ring away and starting again, as brass was far too costly, especially brass which had been worked this far. The chapter ring of the thirty-hour clock is riveted in position ,at XII and VI. So too is the chapter ring of his townless clock. But the Burnley eight-day clock chapter ring is attached in the more 'professional' manner by chapter ring feet, which pin into place. Could this suggest the Burnley eight-day is the latest of the three and that by now he is using the more professional practice? On the other hand if we try to decide by style which of the two eight-day clocks is the earlier, it is very hard to say, but possibly the Burnley one. The two eight-day clocks are probably later than the thirty-hour example, but it is difficult to be sure. We have no photographs of the movements of the thirty-hour or the 'townless' eight-day. The movement of the Burnley eight-day however is pictured here (plate 8) . Although it is exceptionally dirty, it can be seen to be well made, with nicely finned pillars and inside countwheel strikework. Rack striking was already known but was little used in longcase clocks as early as this, and especially in the North-west, where inside countwheel strikework was used for many years yet - often as late as the 1760s and even later. The reason for that was probably because it was more reliable than rack striking, which required a spring, whereas countwheel striking did not, and sooner or later a spring will fail from metal fatigue. An illustration of how countwheel striking was used late in Lancashire arises in a court case concerning third generation clockmaker John Spencer (III) of Colne, which as it happens is the very next parish to Burnley, and where his grandfather, John Spencer (I), was working shortly after Robert Davis's time. It was in the 1830s that John Spencer (III) was pretending to be a bit simple to aid his court case, in which he claimed he had been cheated on account of his simple-mindedness. He had in fact sold his house, but pretended later that he thought he had only mortgaged it and had been deceived through his simplicity, and the court case was his attempt at getting his house back. One witness was local stonemason, who had been called in to look at a longcase clock which Spencer could not fix, although a third-generation trained clockmaker?
. he (the witness) found Spencer engaged in putting a clock together. That the clock was an eight-day repeater and struck wrong. That Spencer looked at the back to try to discover the reason, that on seeing him in search of something he (witness) asked him what he was looking for. Spencer replied that the clock always struck 12 and he (Spencer) could not find out the cause, and that the clock was of a different construction to those that he (Spencer) had been accustomed to, That he told Spencer the clock wanted a spring, and he (witness) put his finger to the place, and then it would strike. Spencer said he had nothing that would answer for a spring, however at the request of the owner's wife, he (witness) put in the spring'. 5. Movement of the Burnley clock from the left-hand side. Note the countwheel on the great wheel, known as inside countwheel striking. Closer view. From this we can tell that the spring of the rack striking mechanism had failed, and that Spencer was looking mystified at the back, where countwheel striking would be located, whereas rack striking was at the front of the movement. Even when he was shown what was wrong and its location, he hadn't got a rack spring! And he a third generation trained clockmaker! I've known some hapless clockmakers in my time, but one who didn't have a rack spring? Presumably this was because he was used to working only on countwheel striking clocks. There is a second reason why some clockmakers, principally those in the North-west of England, often stuck to the older system of countwheel striking. It was possible to run a countwheel striking eight-day clock silently if one wished, that is with the strikework deliberately left inoperative, simply by not winding the striking side, or by removing the strike weight. This could not be done safely with rack striking clocks, and if you try it, two out of three clocks will jam after failing to strike twelve. Moreover there are other reasons why the owner of a rack-striking clock can unwittingly cause the clock not to strike and therefore cause it to jam. Moving the hands round without waiting for the strike, and moving the hands round without first ensuring the clock is wound, are just two. All this means that not only was rack striking more temperamental and prone to faults than countwheel striking, but there was a danger the owner could inadvertently jam his clock by carelessness. Countwheel striking was immune to all such problems - and had no spring to go wrong. These comments relate to countwheel striking on eight-day clocks. Thirty-hour clocks almost always had countwheel striking throughout their entire period of manufacture, and with these the one weight drives going and striking systems simultaneously, which means it is therefore not possible to run thirty-hour clocks silently by the same means. The reason countwheel striking was virtually always used on thirty-hour clocks was probably because it was more robust, dare we say it, almost customer-proof. The cases of these three clocks by Davis are of oak. The first two are simple rustic cases, as we would expect, a little on the chunky side. The third case is very different and has a long starburst inlay in the trunk door. The starburst inlay was used here and there from about 1720 to about 1740, perhaps according to the whim of the customer, principally in northern and north-west England, but examples occur elsewhere too. The most distinctive difference in the third case however is the hood pediment, which is shaped in break-front form. This is a very distinctive style, which I have seen many times on clocks from the Haworth and Bingley area of West Yorkshire. One sees clocks by Michael Heaton of Haworth and the Lawsons of Keighley and Bingley in cases of this nature. As it happens Haworth was the closest ancient parish over the Yorkshire border if you were to travel from Burnley, and the implication is that either this case style reached Burnley too, or that Robert Davis got his cases from Yorkshire. 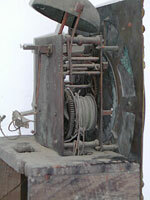 The seatboard arrangement of the newly-discovered Davis clock is also interesting. Most seatboards are just a flat board sitting across, or sometimes nailed down to, the case side uprights. This Davis seatboard however is more like a small trestle table, being the board itself nailed to an upright piece at each side to form a table, the whole of which slides into place inside the case side uprights. I call this a 'Halifax' seatboard, as it was popular in that area with makers such as the Thomas Listers, father and son, and the Lawsons of Halifax and Keighley area - these being neighbouring parishes to Haworth. This seems like further evidence that Robert Davis got this case from the Haworth side of the Pennines. Or else that the practice of using this type of seatboard spread across the hills into Burnley. So this sums up what we know so far of Robert Davis, an enigmatic maker about whose life we know not a single fact. What we know of him is purely through his work, and that shows us that he was an individual who thought for himself and where possible carried out his own handcraftsmanship. And that's something we can't say for every clockmaker, and is what makes Davis's work interesting from a collector's point of view.